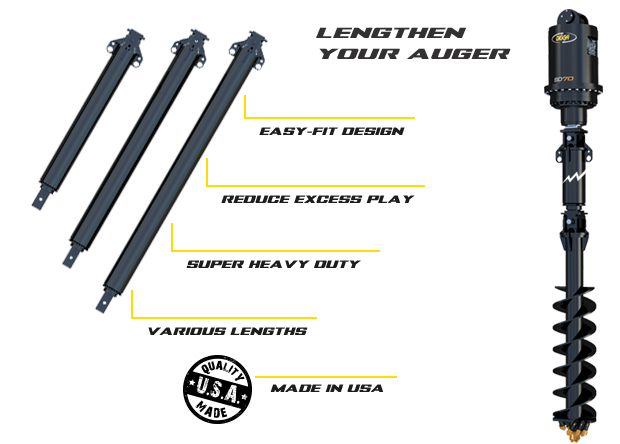 Increase the drilling depth of your auger with Digga's range of super heavy duty auger extensions. For large drive units with 100mm square shafts, XO40-HD outer extensions are available in 3 different lengths - 6ft, 8ft, and 10ft. Super heavy duty welded hubs and shafts provides extensions with more rigidity and reduce excess play in the connections resulting a straighter hole. Various length options available for super heavy duty auger outer extensions including 6ft, 8ft, and 10ft for XO40-HD models.